Our sun is wonderful. Take a positive approach to its energy to soak up its soothing warmth: not always, not everywhere and in moderation. Following these 10 rules will help you enjoy the sun in a healthy way. Give your skin time to adjust. Start off with a cup of coffee in the morning sun or take a walk in the late afternoon, allowing your skin to gradually adjust to the sun. Enjoy a siesta. Avoid the summer midday sun from 11 am to 4 pm, by basking in the comfortable shade. The simplest sun protection is the right clothing. Wear light, long-sleeved clothing made of natural materials such as linen, and a sun hat. Apply sunscreen liberally and frequently. The sun's rays are often more intense at holiday destinations, especially in southern regions or in the mountains. Apply a good layer of sunscreen to unprotected body parts, preferably before you leave the house. Select a sun protection factor (SPF) according to your skin type and the sun's intensity. Swimming reduces the SPF, so re-apply sunscreen regularly. Sun protection from the inside out. Beta carotene, vitamin E and antioxidants can increase the skin's own natural sun protection, when taken on a regular basis. It's simple: carrots, blueberries, beetroots, spinach, tomato paste, olive oil and salmon are just a few of the delicious foods that contain these healthy substances. Drink plenty of fluids. Green tea has good antioxidant properties. Water is also beneficial to the skin, especially if the skin has been over-exposed to the sun and lost moisture through sweating due to the heat. Protect your eyes. Wear appropriate sunglasses or a sun visor. Never look directly into the sun. Cooling after-sun care. 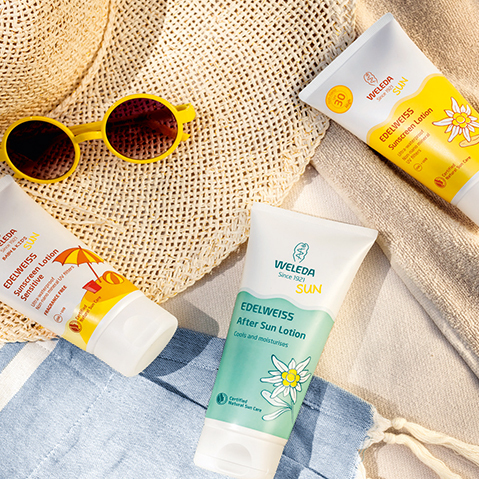 In the summer, store your Weleda After Sun Lotion or Pomegranate Serum in the fridge, so you can enjoy their extra-cool freshness when applying them to your skin. Quick sunburn relief. In the case of sunburn, get out of the sun and cool down. Drink plenty of water. Pure coconut oil, like all oils or ointments, is not a good remedy for sunburn, as it can cause heat build-up in the skin. To care for sunburned skin, it's better to use a soothing skin lotion. Tip: The gel from the fleshy leaves of the aloe vera plant cools and calms the skin wonderfully. Simply spread the exposed pulp over the skin. * Note: In case of open wounds or large areas of severely sunburned skin, seek immediate medical treatment.